Bangladesh is located in southern Asia. Bangladesh is bordered by the Bay of Bengal, Myanmar (Burma) to the east, and India to the east, north, and west. Google Earth is a free program from Google that allows you to explore satellite images showing the cities and landscapes of Bangladesh and all of Asia in fantastic detail. It works on your desktop computer, tablet, or mobile phone. The images in many areas are detailed enough that you can see houses, vehicles and even people on a city street. Google Earth is free and easy-to-use. Bangladesh is one of nearly 200 countries illustrated on our Blue Ocean Laminated Map of the World. This map shows a combination of political and physical features. It includes country boundaries, major cities, major mountains in shaded relief, ocean depth in blue color gradient, along with many other features. This is a great map for students, schools, offices and anywhere that a nice map of the world is needed for education, display or decor. 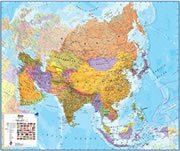 If you are interested in Bangladesh and the geography of Asia our large laminated map of Asia might be just what you need. It is a large political map of Asia that also shows many of the continent's physical features in color or shaded relief. Major lakes, rivers,cities, roads, country boundaries, coastlines and surrounding islands are all shown on the map. Bandarban, Barisal, Begamganj, Bhola, Bogra, Brahmanbaria, Chittagong, Comilla, Cox's Bazar, Dhaka, Dinajpur, Gazipur, Gomastapur, Habiganj, Ishurdi, Jamalpur, Jaria, Jessore, Khulna, Mymensingh, Narayanganj, Nawabganj, Pirganj, Rajshahi, Ramgarh, Rangamati, Rangpur, Saidpur, Sylhet, Tangail, and Teknaf. Barisal, Chittagong, Dhaka, Khulna, Mymensingh, Rajshahi, Rangpur, and Sylhet. 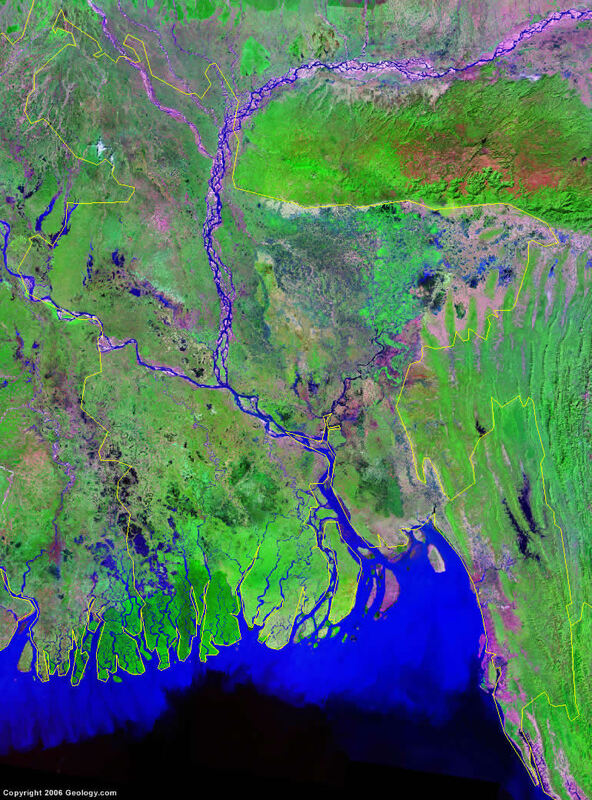 Atrai River, Barkal Lake, Bay of Bengal, Brahmaputra River, Ganges River, Jamuna River, Jamuneswari River, Kabadak River, Kalni River, Karnaphuli Reservoir, Kusiyara River, Kutubdia Island, Madhumati River, Maheshkhali Island, Meghna River, Mizo Hills, Mouths of the Ganges, Padma River, Sandwip Island, South Hatia Island, Surma River, Swatch of No Ground, and Tista River. Fossil fuel resources include natural gas and coal. Other natural resources include arable land and timber. Although Bangladesh's natural hazards include droughts, much of the country is subject to cyclones and is routinely flooded during the summer monsoon season. Bangladesh has severe overpopulation, therefore many people are landless and forced to live on and cultivate flood-prone land. There are environmental issues, which include water-borne diseases prevalent in surface water, and contaminated ground water by naturally occurring arsenic. The country has water pollution, especially of the fishing areas, which resulted from the use of commercial pesticides. In the northern and central parts of the country, there are intermittent water shortages because of falling water tables. Bangladesh also has soil concerns with deforestation, erosion and soil degradation.